Whenever you break a subroutine on a piece of ice, you may pay 1credit to break 1 subroutine on that ice. CyberSolutions' e3 line of implants trade strictly in muscle memory and automatic responses, freeing the brain to focus entirely on cerebral tasks. Once seen only as a salve for the expensive cost-to-break Criminal programs Aurora and Peacock, e3 saw a brief bit of light beyond the box when Darwin decks were popular. Its primary use was to make Haas-Bioroid players sweat bullets, a secondary function then was to save a credit per extra subroutine broken. Now it may be having something of a resurgence, thanks to new cards in the meta. HB Bioroid lovers weep once more. NB: this is the second ANR card to receive an Erratum (in FAQ v1.5); the (redundant) word "additional" was removed to make the card read how it was correctly & intuitively being played. • Hardware that breaks subroutines, so it doesn't consume MU. • Only 2 Influence, so moderately splashable. • Triggers itself, so once one subroutine has been broken, e3 can take care of the rest. ** this means that a click-break of a Bioroid Ice subroutine can trigger e3, allowing the rest to be broken with just credits and no icebreaker. • With an efficient cost-to-break Icebreaker suite, e3 isn't much use, making it a dead draw unless you intend to click-break Bioroids. • but then, why would you include it? • Using Grappling Hook to break all but one subroutine, e3 deals with the last annoying one. • Quetzal's barrier-busting ability can trigger e3, meaning that she is able to walk through Eli 1.0 once per turn for a mere credit. • Knight is one of the more popular AI breakers, costs 2 credits/subroutine to break and so combos well with Quetzal as well. Everybody is talking about how good thee3 Feedback Implants combine with Adam or Hunger. Does noone see the way more often played Card that synergizes greatly with this? Multiple Subs on an Ice are the most taxing Problem for Faust. A Spiderweb for example shrinks from 3 Cards to 1 Card and 2 or an early Hive from a whoopin 6 Cards to 2 Cards and 4 . Archer, no runner wants to see fire also comes down from 6 Cards to a relaxing 3 Cards and 3 . Of course it's even more cool, if you didn't have to pay Cards or for the initial break like Quetzal or Adam, but if Faust your Mainbreaker, it's great if you can divide the Tax between Cards and . I always try to squeeze 1 or 2 e3 Feedback Implants in, if I play the develish one. In addition to ODie's comprehensive review, E3 can also extend the lifetime of Power-Counter-based breakers like Overmind, D4V1D and the new Dog breakers, or to avoid additional costs from Midway Station Grid. This card is extremely useful to Adam and Apex. 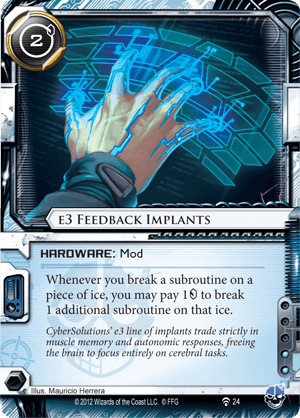 Similarly, if a piece of ICE has an end the run subroutine, Apex can use his Endless Hunger with E3 to break through every other subroutine as well without having to burn through as many installed cards. While I completely agree with jdharper's review of this card in relation to Adam: Compulsive Hacker and Apex: Invasive Predator, I feel there are more than a few serious drawbacks one needs to consider before including these in those decks. First, e3 Feedback Implants costs 2 influence a piece. You will likely want multiple copies to see it early, so that's around 4-6 influence. Adam has no breakers in faction, and Apex has only one rather powerful breaker that (arguably) needs backup. Adam also has no money in faction outside of Multithreader, which as jd pointed out, can't be used for e3. Also no multiaccess for Apex, and Adam needs RnD multiaccess... My point is this: you are paying 4-6 influence on a card that you want early, but once you have it the rest are dead cards. That's a lot of influence and card slots for the functionality this card offers. Ask anyone who has been playing these new runners and you'll find that 25 influence, while it seems like a lot, in reality is a very precious resource. Second, e3 still costs money and money is difficult for these new runners. Now, granted, they are going to be spending money on standard breakers anyway, but then this begs the question: why use e3 in the first place? Why not spend the extra influence and slots on efficient breakers and out of faction money cards? This is a difficult question for Adam in particular because he can only make use of e3 for one piece of ice per turn with his ability. Perhaps e3 can be used in conjunction with "2c to break" breakers like Sunny's, but is it really worth all the influence for such a small added utility? Third, it is hardware and can't easily be tutored. So if you are building heavily around this card there isn't a real effective way around multiple copies, which as a mentioned earlier, ends with you have dead cards in your deck once it's installed. I think e3 can be really strong. Adam being able to get through any ice in the game for a couple clicks and creds is particularly powerful. But it all comes at a cost, and influence is as tight as ever. In any case, I think it is a good card that requires careful consideration before inclusion.